Delphi Vision Broadcasting invites you to look through our site to find out more about The Donna Seebo Show and our new show, Warriors for Peace. And please visit our publications site, Mrs. Seebo’s Classics, for audio books, e-books, and printed books. The menu will guide you to details about Donna, her skills, schedule of activities, upcoming guests, videos, her monthly newsletter and ways you can contact her. Thank you for stopping by and we invite you and your friends to come back as often as you like. The Donna Seebo Show and Warriors for Peace are now part of Delphi Vision Broadcasting. Currently streaming to over 58 countries, plus people throughout the U.S., are listening to our shows. Donna invites you to join her daily for informative and uplifting positive programming. And you can listen to recently broadcast shows that are being streamed 24/7. Join Donna weekdays, Monday through Friday, for The Donna Seebo Show, 8:00 PM to 9:00 PM, Pacific Time; 11:00 PM to12:00 AM Eastern. This program is live and callers are welcomed during the second half of the show. Free readings are given, questions answered. The show call-in number is 253.582.5597. Thank you so much for your wonderful and so edifying authors, writers and recipes and encouragement. For two years I have enjoyed your programming and show. Please let it be known your encouragement has been added benefit too. Your program is gratefully added to my day . 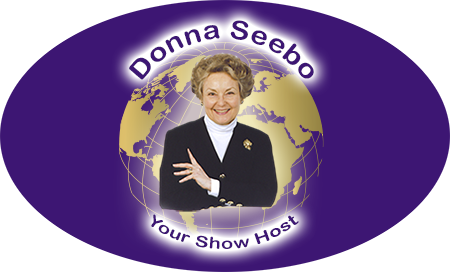 Join our mailing list to receive the latest news and updates about THE DONNA SEEBO SHOW and WARRIORS FOR PEACE podcasts, including MRS. SEEBOS CLASSICS publications. You will be automatically redirected to the current issue of our newsletter that will load into your browser window. Thank you.